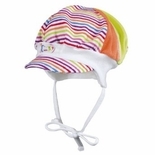 Maximo and Ergee are better priced European brands of Spring & Summer Baby Hats (and socks). These two companies manufacture very similar hats, great for newborn to teens. They are reknown for their exquisite details, beautiful embroideries, superlative fabrics and up-to-the-minute fashion, all designed to take children from cradle to kindergarten in timeless fashion. We have adorable cute trendy Spring & Summer Baby hats and baseball caps well priced too. Chin straps, ties, or fastening tape-closures under the chin help keep the hat in place.